Brief historical summary: At the beginning of the 20th century, the English Toy Terrier was one of the most popular toy dogs in Russia. However, in the period 1920 – 1950 the breeding of pure toy terriers was almost stopped and the number of dogs fell to a critical level. Only in the mid-fifties did Russian dog-breeders begin the revival of the breed. Practically all dogs which were used for breeding had no pedigrees; many of them were not pure blood. The Standard drafted for Toy Terriers significantly differed from that of the English Toy Terrier in many aspects. From this moment, the evolution of the breed in Russia went its own way. On the 12th of October, 1958 two smooth-haired dogs, one of which had slightly longer hair, gave birth to a male dog with a spectacular fringes on ears and limbs. It was decided to keep this feature. The male was mated with a female which also had slightly long hair. Thus the longhaired variety of the Russian Toy appeared. It was called Moscow Longhaired Toy Terrier. A dog breeder from Moscow, Yevgueniya Fominichna Zharova, played an important role in the creation of this breed variant. It was during a long period of development, in an isolated context, along with a specifically conducted selection that a new breed was created : the Russian Toy with two varieties: Longhaired and smooth-haired. 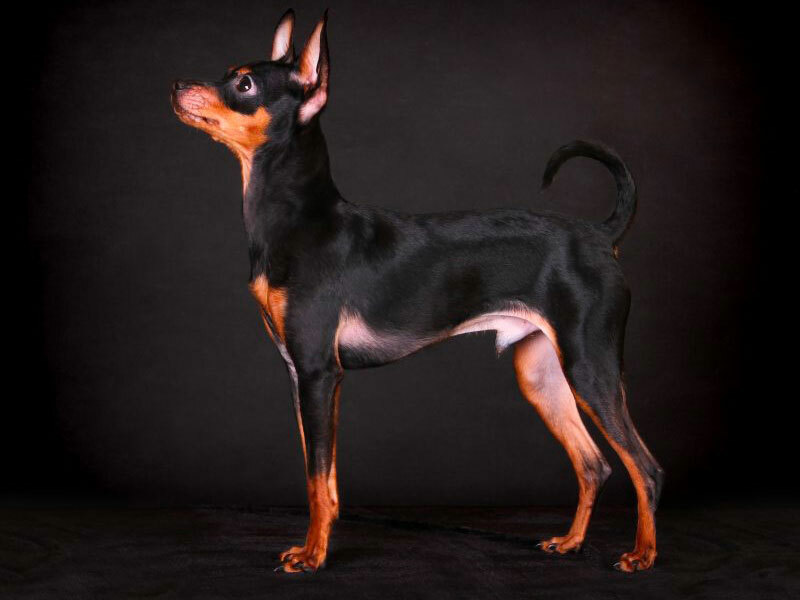 General appearance : A small elegant dog, lively, longlegged, with fine bone and lean muscles. Sexual dimorphism only slightly defined. Behaviour / temperament: Active, very cheerful, neither cowardly nor aggressive. The behaviour is significantly different between males and females. Gait / movement: Easy, straightforward, fast. No noticeable change in the topline when moving. Smooth-haired: short, close-lying, shiny hair, without undercoat or bald patches. Longhaired: body is covered with moderately long (3-5 cm), straight or slightly wavy hair, close-lying, which does not hide the natural outline of the body . Hair on the head and on the front part of limbs is short and close -lying. Distinct feathers on rear side of limbs. The feet have long, silky hair which completely hides the nails. Ears are covered with thick, long hair forming a fringe. Dogs of more than 3 years have such a fringe, which should completely hide the outer edges and tips of the ears. Body hair should not look tousled nor be too short (less than 2 cm.). Level bite or incisors sloping forward. Semi-pricked ears. This condition in longhaired dogs with heavy fringes is permissible but not desirable. Presence of bald patches in smooth-haired dogs. Too long or too short hair on body of longhaired dogs. Small white spots on chest and toes. Solid black, brown and blue colours. Tan markings too large or with dark shadings. Overshot, pronounced undershot. Absence of 1 canine; absence of more than 2 incisors in either jaw. Many bald patches in short-haired dogs. Longhaired dogs: absence of fringes on ears and presence of curly hair. White coat, white spots on the head, abdomen and above metacarpus; large white patches on chest and throat, presence of brindle markings. Size over 30 cm or under 18 cm. Weight less than 1 kg.